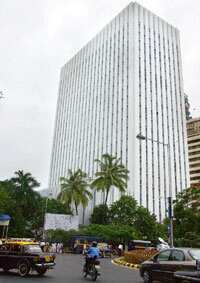 Moving cautiously: The headquarters of State Bank of India at Nariman Point in Mumbai. State-run banks said they would assess the impact of RBI’s move before deciding whether to lower interest rates. Mumbai: State-run commercial banks are expected to lower borrowing costs by as much as 50 basis points after the Reserve Bank of India, or RBI, reduced its policy rate for the second time in a fortnight and used other tools in its arsenal to boost banks’ ability to lend and ease a credit crunch roiling the economy. Banks said they would assess the impact of Saturday’s moves by RBI before deciding whether to lower interest rates and by how much, but economists are convinced that a cut in both lending and deposit rates by between 25 and 50 basis points will ensue in the next few days. One basis point is one-hundredth of a percentage point. State Bank of India, or SBI, the country’s biggest lender, is evaluating the impact of RBI’s action and will take a decision soon, said chairman O.P. Bhatt, adding that the bank will also offer liquidity support to mutual funds and non-banking finance companies. RBI lowered its repurchase rate, the key short-term lending rate, to 7.5% from 8%, cut the cash reserve ratio, or CRR, the proportion of deposits that banks need to keep with it, to 5.5% from 6.5%, and the statutory liquidity ratio, or SLR, the amount they are required to invest in government bonds, to 24% from 25%. Bank of Baroda chief M.D. Mallya said there could be 50 basis points cut in lending rate. “We need to analyze the impact. There is always a lag effect," he said. SBI could trim rates by at least 25 basis points, said a bank official who didn’t want to be named. Finance minister P. Chidambaram is meeting public sector bank chiefs on Tuesday discuss the situation. Analysts expect more cuts in the policy rate and the CRR in the coming months, but Indian firms are not convinced that banks will immediately pass on the benefit of the latest RBI measures to borrowers. “It remains to be seen whether banks will lend in the current scenario as other sources of funds, including overseas debt and mutual funds, are drying up," said D.D. Rathi, chief financial officer at Grasim Industries Ltd, India’s third largest cement maker. “There are few lenders and more borrowers. They (banks) are in no hurry to lend. There is a crisis of confidence in view of the global financial crisis," Rathi said. RBI acted after the overnight money-market rate soared to more than 20% last week. A decline in inflation to below 11% gave RBI room to cut borrowing costs. Wholesale prices rose 10.68% in the week to 18 October compared with 11.07% in the previous week. “This is is not the end of rate cut regime. We are expecting a further 50-100 basis points cut in repo rate and 100 basis points in CRR," said Shubhada Rao, chief economist at Yes Bank Ltd.
A. Prasanna, chief economist of ICICI Securities Primary Dealership Ltd, which buys and sells government bonds, said RBI will continue to cut rates and create liquidity to provide stimulus to economic growth, which the central bank has forecast to slow to 7.5% in the current fiscal year from 9.1% last year. “Global credit market has not yet come back to life and if all Indian firms turn to the domestic system for money, there will be problem. There could be more cuts in rate and CRR," he said. IDBI Bank Ltd on Saturday reduced its home and education loan rates by 50 basis points across the board for all existing and new customers, but chairman Yogesh Agarwal said it was “just realigning the home loan rates with the market and this cut has nothing to do with the RBI measures." “The RBI rate action does not signal that interest rates have to be lowered in the short to medium term. There is no scope for lending rates or deposit rates to come down immediately," said Agarwal. Punjab National Bank had cut its prime lending rate, or PLR, the rate at which a commercial bank lends to its best customers, by 50 basis points to 13.50% on Friday. Chairman K.C. Chakrabarty said the bank will review its lending and deposit rates “after assessing the situation" but the New Delhi-based bank is unlikely to offer another round of rate cuts anytime soon. Till recently, about 80% of borrowers were accessing bank loans at less than the PLR until the liquidity squeeze prompted banks to charge most customers a hefty premium over their prime rate, a trend which the central bank will likely try to curb. “We are charging high rates as there is hardly any liquidity in the system. But the downside risk is high rates dent the borrowers’ capacity to pay. So, we will end up piling bad assets," said the chairman of a large bank who did not want to be named. R.S. Reddy, chairman and managing director of Andhra Bank, said his bank will evaluate the situation and “unless we are assured that we have no problem acquiring cheap deposit, we cannot cut rates." Banks will likely first cut deposit rates first and then trim lending rates. The asset-liability committee of Hyderabad-based Andhra Bank will meet later this week to take stock of the situation and, “if we feel the liquidity situation has improved, we might see some easing in interest rates," Reddy said. According to T.S. Narayansami, chairman and managing director of Bank of India and head of the Indian Banks’ Association, or IBA, the industry lobby, the rate cut augurs well for deposits rate to come down. “We will review our lending rates after the next fortnight," he said, adding the 350 basis points cut in the CRR over the last few weeks has given a significant “cost advantage to banks". Private sector banks are not likely to cut rates anytime soon. Said V. Vaidyanathan, executive director, ICICI Bank Ltd, India’s largest private sector lender, “We are hopeful that the RBI move will pump in necessary liquidity into the system and will have a cooling impact on interest rates. Only time will tell if these steps will be enough as the environment is highly uncertain." HDFC Bank Ltd’s executive director Harish Engineer also said the bank will assess the situation before taking a decision on interest rates. “We could see some softening in deposit rates over a period of seven to 10 days," he said. Keki Mistry, managing director of Housing Development Finance Corp. Ltd, or HDFC, India’s oldest mortgage player, told a television channel on Saturday, “I would not cut PLR unless funding costs come down. Interest and borrowing rates are still high."